Another Willie Dixon song … that’s 3 in a row!! This one is being performed by Sonny Boy Williamson II – whose real name was Alex “Rice” Miller. The Alex is pronounced Aleck. He was the youngest of 21 children in the Miller family. There is plenty of conjecture about how, when and why he took up the name Sonny Boy Williamson … especially as John Lee Williamson had the nickname “Sonny Boy”. 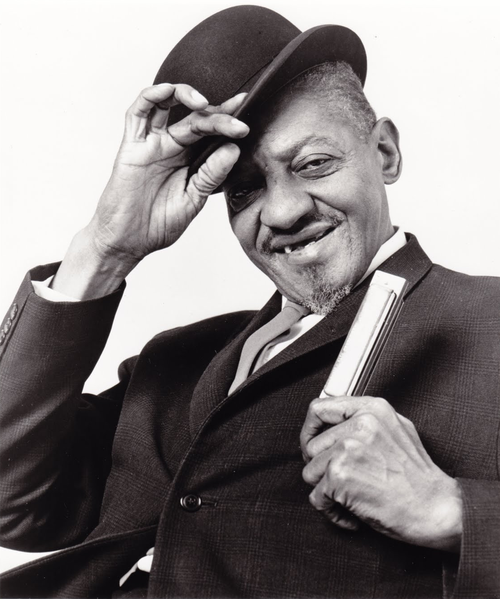 Who had the name first is disputable but “Rice” Miller has become known as the second Sonny Boy Williamson or Sonny Boy Williamson II … and King of the Blues Harmonica. One of Sonny Boy’s great “tricks”: instead of dragging the harp laterally across the front of his mouth, he’d stick the harp end-first into his mouth and play it, no hands. On 21st November 1941 Sonny Boy Williamson II along with Robert Johnson’s stepson, Robert Lockwood Jr played live for the debut broadcast of King Biscuit Time – a radio show broadcast on KFFA in Helena, Arkansas. King Biscuit Time became the longest running American radio program in history – it is still going today and is approaching episode 17,000. 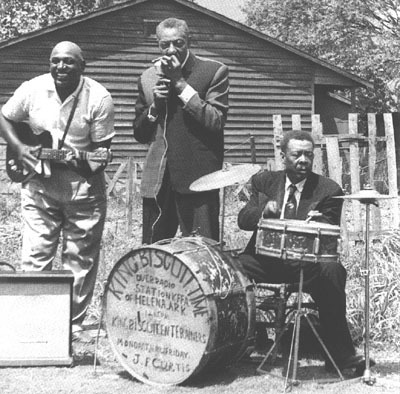 The show’s original band – The King Biscuit Entertainers – included Sonny Boy, Robert Jr, Pinetop Perkins & Peck Curtis. The show’s sponsor, King Biscuit Flour, increased their flour sales from 2 car loads every 6 months to 2 car loads a week!! Now, that’s a great endorsement for sponsorship. Sonny Boy & Robert Jr started playing with amplification in about 1938. They fed their instruments through car radios and juke boxes so they could be heard by larger crowds. They were helped in this by a close friend who was a radio repairman. His name? Elmore James. 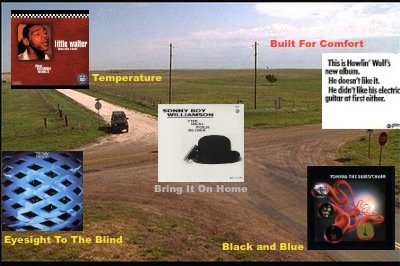 Crossroad 4 featured The Live Adventures of Mike Bloomfield & Al Kooper. That album includes a song called “Sonny Boy Williamson” written by Jack Bruce and Paul Jones to pay homage to the great blues harpist. In the “Other Stuff You May Like” section below, there is a link to Paul Jones’ performance of this song. Well Willie Dixon is again a connector. Also Sonny Boy was Howlin’ Wolf’s brother-in-law for a while. It was Sonny Boy who taught Howlin’ Wolf to play the “Mississippi saxophone”. The lessons took place, as Howlin’ Wolf put it, “while Sonny Boy was kissin’ on my half-sister Mary”. * Sonny Boy Williamson – Lonesome Cabin – I can’t find much footage of Sonny Boy in action but here is one – just him and his harp. * King Biscuit Time Show on KFFA Radio – this takes you the page on Radio KFFA’s website that has the last 10 episodes of the King Biscuit Time Show. * A lovely (and too short at 2m 10s) video with Chris Dreja (Yardbirds) & Paul Jones (Manfred Mann) talking about Sonny Boy Williamson. There’s also some nice footage of Sonny Boy taking the stage in his signature full British regalia – suit, bowler hat, umbrella, & brief-case. Paul Jones co-wrote (with Jack Bruce) the song “Sonny Boy Williamson” perfumed on the Live Adventures of Bloomfield & Kooper album. * Sonny Boy Williamson by Paul Jones – this is the song mentioned above, performed by Paul Jones. It was released in 1967 as the B side to his single I’ve Been A Bad Bad Boy. * A great blog post about King Biscuit Time from New England Public Radio. This post contains a link to some silent colour film footage of Sonny Boy & Robert Lockwood Jr doing their thing for the radio show. Oh what the hell … here is that link!! * Robert Plant interviewed in Tutwiler, Mississippi at a dedication to W C Handy but Plant mainly talks about Sonny Boy. (4 min 16 sec). Sonny Boy Williamson is buried at Tutwiler.